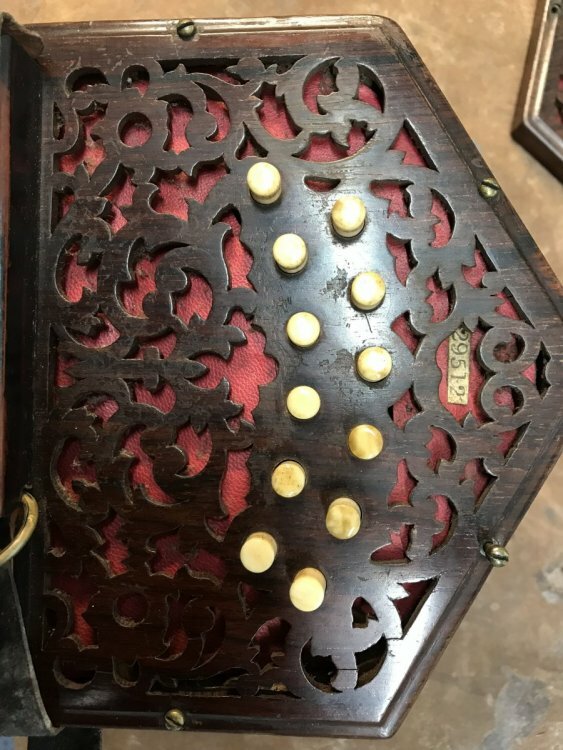 i have recently purchased a a 24 key c g Anglo , it has rosewood ends , it looks like this instrument was manufactured with 24 keys from the get go. i haven’t seen another like this . It does require a good service , buts seems quite sound . serial number inside of ends and bellows says 29512 , Also has the J. Wallis , London label on the other end . can any one help with a date / information ? Are the extra keys a continuation of the scale, or accidentals, or reversed duplicates? Hello all , you are correct we have a C# D# , on the right hand side + another C#/ b where the C/b would normally live. the left hand side is not yet identified, the reeds are not sounding and I can’t see a note “stamp” , investigation ongoing! I have no idea but I suppose @Dowright can provide approximate date from the serial number. Slightly off topic, Barleycorn now lists 22 key Lachenal C/G which has G#/Bb on the LHS and C#/D# on the RHS. That’s amazingly good information! Thanks to all . the instrument will get a tune up and some pads , should be good for a few years yet !